Under the auspices of H.E, the Minister of Education and Higher Education, represented by Deputy Minister Dr. Basri Saleh; and with the distinctive presence of the EU/Erasmus Head of Unit in the world, Mr. Ralph Rahders, and the EU Head of Cooperation Ms. Alessandra Viezzer; the Islamic University of Gaza hosted Erasmus+ (2019) Information Day in Palestine via Video Conference on the 12th of November 2018. The Director of the National Erasmus Office in Palestine opened the information day and welcomed the audiences. He overviewed the impact of Erasmus in Palestine and the main achievements of Higher Education institutions. 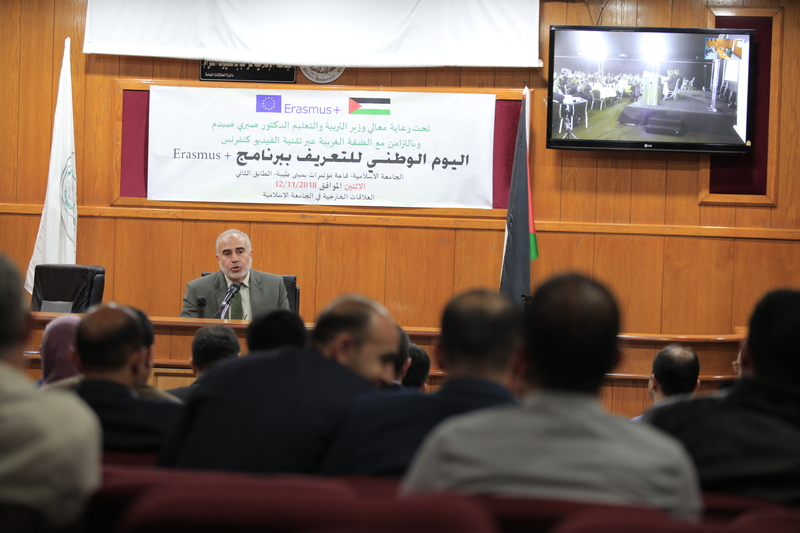 In his speech, Professor Nasser Farahat, the president of the Islamic University expressed his appreciation for the Erasmus Program and team and the role of universities in Gaza with the programme. In his opening speech, the Minister of Education and Higher Education represented by Dr. Basri Saleh, Deputy Minister of Education, stressed on the significant role that the EU has been playing through the support of Palestinian Higher Education Institutions; where the National Erasmus+ Office has been remarkably modernizing the system of Higher Education by creating new opportunities for the systems of Higher Education and bridging gaps amongst the Palestinian, Arab and European Higher Education Institutions. In his speech, Mr. Ralph Rahders expressed his appreciation of the NEO, the Ministry of Education and the EU. He has also expressed his excitement to be in Palestine for the first time. In her speech, Mr. Alessandra Viezzer, European Union Head of mission highlighted expressed her appreciation of the success of Erasmus+ in Palestine and highlighted the role of EU in supporting education and HE. Within the first session, the Deputy Minister of Education Representative, the European Union Representative and the NEO Director congratulated the winners of the 2018 call for proposals from the Palestinian universities, and encouraged them to continue their successful engagement in the Erasmus+ programme for the benefit of the Palestinian students and academic institutions. In the second session, it was initiated to present the new Call for project proposals within the European Union Erasmus+ programme which includes information and guidelines of how to apply to the following programmes: Capacity Building for Higher Education, Mobility, Erasmus Joint Master Degree, Jean Monnet and Erasmus Plus Virtual exchange. During the day, new opportunities were introduced to the Higher Education Institutions to benefit from the different EU programmes; along with genuine experiences from successful projects. By the end of the day, comprehensive information was provided on the applications to the different programmes, the grants, and the networks with Palestinian universities together with the national priorities of the higher Education.